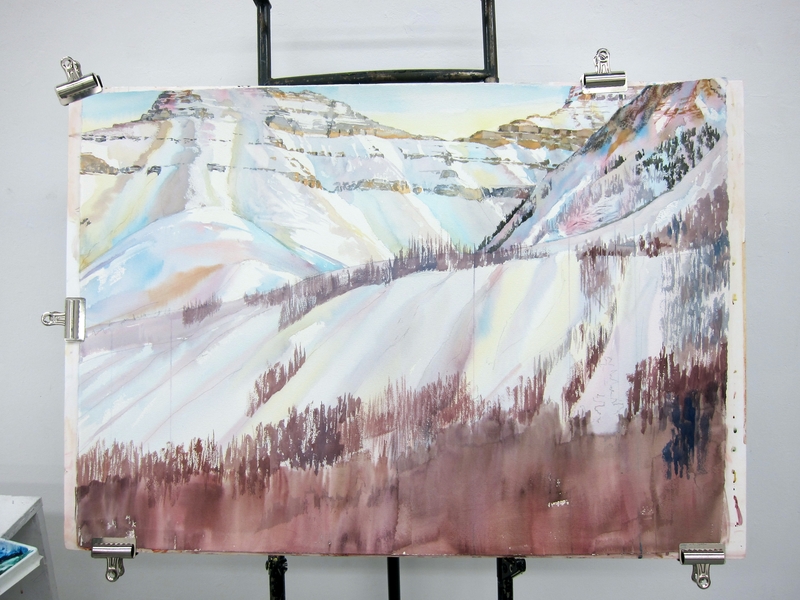 Today I continued to rework an older piece, Davis Peak Burn #7, shown below as the flat image with the Christmas tree cookie cutter hanging alongside it. I also took several more older small burn paintings and posed them rolled on the wall. I find this presentation compelling, invokes the abstract, idealized tree solid while still engaging the eye with the painting. To be sure, I have to come up with some superstructure to support them, I don’t intend to show them with rubber bands around them! Worked back in over the thin gesso, took out a stump and added another snag. Will burn-drawing look right or wrong with traditional watercolor on paper? And I made quite a bit progress on a view of the Kootenays with the Vermillion Pass Burn in the foreground. Tomorrow I intend to use the woodburning tool to draw the snags and downed lumber in the foreground. It will be the first time I’ve tried to combine traditional watercolor painting with burn-drawing. 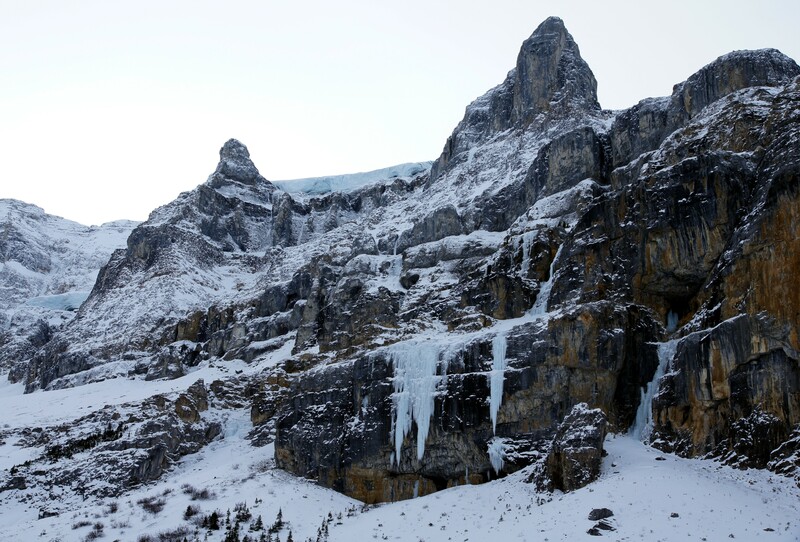 I walked up Tunnel Mountain again in an inch of new snow on ice in places. Thanks to my microspikes, it was a normal walk in the park. The peaks were in and out of clouds, and I was reminded how much I need to get outside every day. I am remiss in not having done this at the outset – informed readers of the goals of my residency. What I wrote in my application proposal is that I wanted to expand my body of work I call The Burnscapes. They’re watercolors of burned-over forest lands and trees — that is, distant landscapes and close-up “portraits” of individual trees. I said I wanted to expand this work “literally” (forests beyond the Pacific Northwest of my home), “technically” (explore new methods and techniques, improve my understanding of the science), and “artistically” (which I did allude to in mentioning philosophical contrasts in my November 16 posting). Much as I love the sudden magic when our brains are manipulated by two-dimensional marks to leap into an illusory third dimension, I need to move beyond simple (or even sophisticated!) rendering. I’ve been pleased with the self-mixing random flow and drips of my Numbers series, especially in contrast to tight rendering. Credit to Etsuko Ichikawa, who creates large-scale banners by rolling hot glass over paper, I wanted to try using burning itself as a form of drawing. Great that my new woodburning kit came back from Thanksgiving in carry-on without incident! And I’ve been experimenting with new ways to present the existing body of work. I’m intrigued by what happens visually and intellectually when existing paintings are curved into semi-columns, though I have no idea yet how to make such a presentation flexible, stable and archival. I also learned from my residency at the Vermont Studio Center that having personal production goals, while seemingly laudable and efficient, somewhat wastes the opportunity. Here is a chance to be directly influenced by the other attendees, to open my thinking to other opinions and practices. So I look forward tonight to the presentations of the other “self-directed” artists-in-residence, and to more studio visits between us. Tomorrow I go home for Thanksgiving, and I’m ready. I’m burned out on working in the studio almost all the time. The weather is changing, warming up to snow, no more spectacular distant views. Yesterday I walked up Tunnel Mountain behind the town. I tried another soldering iron drawing using the bamboo & hemp sumi paper given to me by Japanese artist Kenji Fuji in the next studio. A little bit easier, but still very slow. The soldering iron isn’t really hot enough, so drawing is a jerky, meditative and mildly frustrating process. The sheet size made me think of the old stereoscopic scenic photos for tourists, appropriate for an old resort town like Banff. So I did two drawings of the same general scene — not only has the technology since changed, but the forests have, too. I like the spareness of the drawing; it’s amazing how much topography simple lines can imply. I call them What the Fire Wrote (top) and, with apologies to Robert Frost, Stopping in the Snowy (Former) Woods. After the First Death is almost finished. I will never learn to stop when I should, it’s lost some of its freshness. But I am satisfied with its powerful impact, at double life-size. I’d like to see it hung on a semi-circular bas-relief-column. After the First Death 76 x 51 in. I should report that one of the privileges of being here at the Banff Centre is attending events from other disciplines. On Wednesday I heard the mountain writers read from their works — which was right up my alley. And last night I heard truly world-class music from visiting artists and residents. I’m not usually a Stockhausen fan, but everything Lafayette Quartet played was mind-bending. And young Heidi Wall played a Paganini-inspired Lizt étude to perfection. A great pleasure. Today I took an old painting, Burned Burl and tried hanging it semi-rolled. This works pretty well so long as the subject is a single trunk, might not work as well in a broader landscape. Still it might be pretty cool with giant After the First Death (photo below gives some sense of its scale). And here is the current state of Vermillion Pass Burn. I overworked it, as usual. Maybe it will look better tomorrow morning. I tried my third iteration of drawing with a soldering iron. I pasted the fragile rice paper to a watercolor paper backing first, and then attached scrolls of rice paper to either side. When I am done there will be sticks with burned tips poking out of the scrolls. But that may wait for a day that is not -22 degrees Celsius. Today I resolved not to spend every moment in the studio and walked a loop around Tunnel Mountain. Spectacular. I think it’s done, but I should have stopped an hour earlier. “Burned Burl” semi-rolled – A new way to present the burnscapes? Only the lights are in. I could tell the sky was blue through the clerestory windows, but I never was out in it. I arrived before light and left long after dark. I made lots of progress on Vermillion Pass Burn. Here is yesterday’s state. Next photo is today’s. On location I was really struck by the vastness of the fire, which jumped the road at Marble Canyon. I want to convey not only the immensity of the landscape in the Rockies, but the pincushion carpet of standing dead trees. I should point out that the piece is 30 x 41, but it seems entirely manageable compared to my other project. 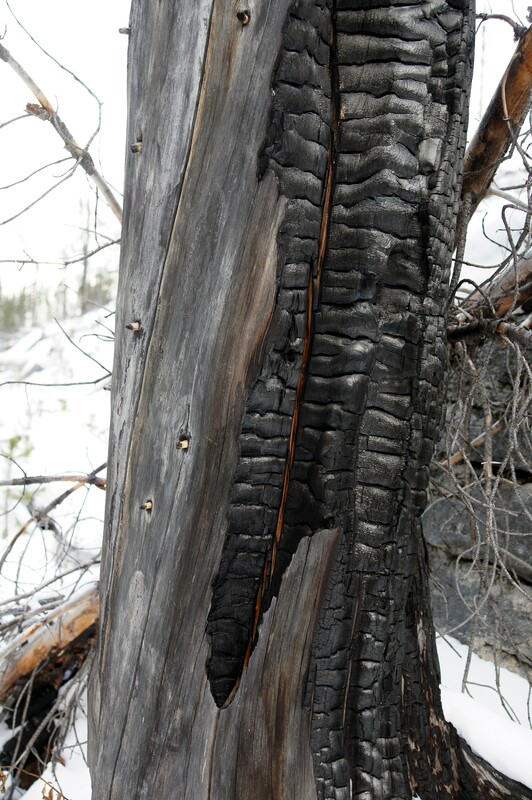 After the first death, there is no other is a close-up view of the fire-scar on a tree I saw on the Stanley Glacier trail off 97A. If you look at the implied basin in the top middle portion of Vermillion Pass Burn, that’s where it is. I spent portions of the last two days gessoing both sides of this 51 x 76 sheet, and I had to get help to hang it on the wall. I can’t quite reach the top and have to climb onto a step to work on it. Luckily I know from previous experience that the first layer usually looks ugly, or I’ve had given up. Finished the background rocks, and began the dead trees. I haven’t given up on drawing with a soldering iron, either. So far the only paper that works is some very old and fragile rice paper. After several tries I realized if I adhered it to a backing I first I wouldn’t be trying to carefully lift it off to impossibly transfer it to a backing. So I got out the giant roll of watercolor paper and glued the rice paper to a 51 x 13.5 inch strip. Heat-drawing this way will be tomorrow’s experiment. Dinner calls, but if today is like yesterday, I’ll be back in the studio for another few hours. Half of the first layer. None of the fire scar is in yet. I brought with me several old burn paintings to use as fodder for experiments. I bought candles and matches and burned the edges of Lake Caroline Burn. Not too bad, though it does kind of remind me of the kind of corny pictures you’d see laminated onto a wood plaque in someone’s cabin. 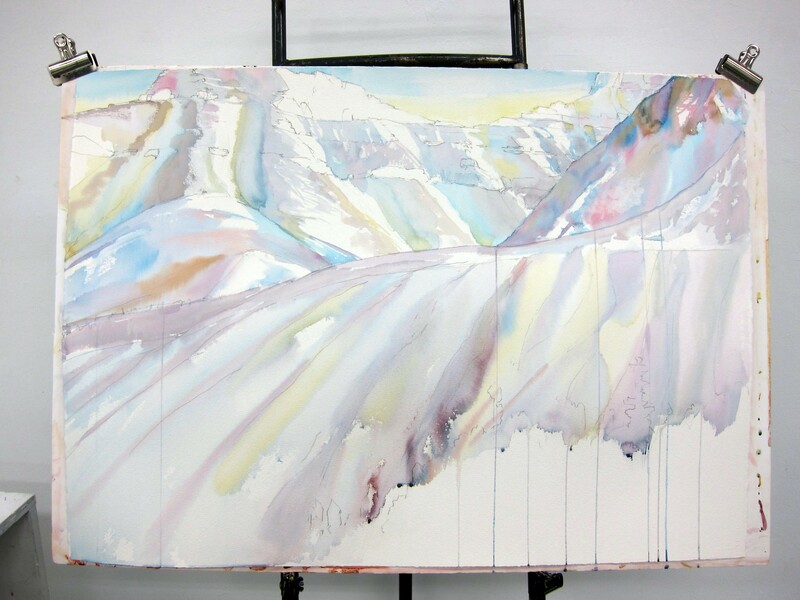 I took one of the Davis Peak burn paintings and let a thin coat of gesso drip down it. I also took the Christmas tree cookie cutter to cut out a section, and then rehung it with the painting. Finally, I tried drawing with a soldering iron. It really didn’t work on watercolor paper — you have to rest the iron too long in any given place to get a mark — but it kind of worked on rice paper. I tried gluing the results onto watercolor paper, but it still has lots of distracting bubbles and wrinkles. Very painstaking to handle. Maybe tomorrow I’ll come up with an answer. I also have a drawing for a traditional landscape painting on my easel, with part of some peaks and a great swatch of the burned section near Vermillion Pass from 2003. Lake Caroline Burn – Does it seem any more compelling with burnt edges and split in two? The cold, weeping wall of Mt. Stanley, with bits of blue glacier ice upper left and skyline. Today I hiked up to the Stanley Glacier near Vermillion Pass in the Kootenay National Park, walking through the immense burn of 2003. The reason there’s still a glacier in that hanging valley is because it’s always in the shade — it was so-o-o cold. I was completely alone. Then I stopped briefly at the Marble Canyon trailhead. In 2003 we would have started there for Fay Hut, the Alpine Club of Canada’s oldest hut, but it burned in the same fire. There was a small prescribed burn on the Trans-Canada on my way back to Banff. 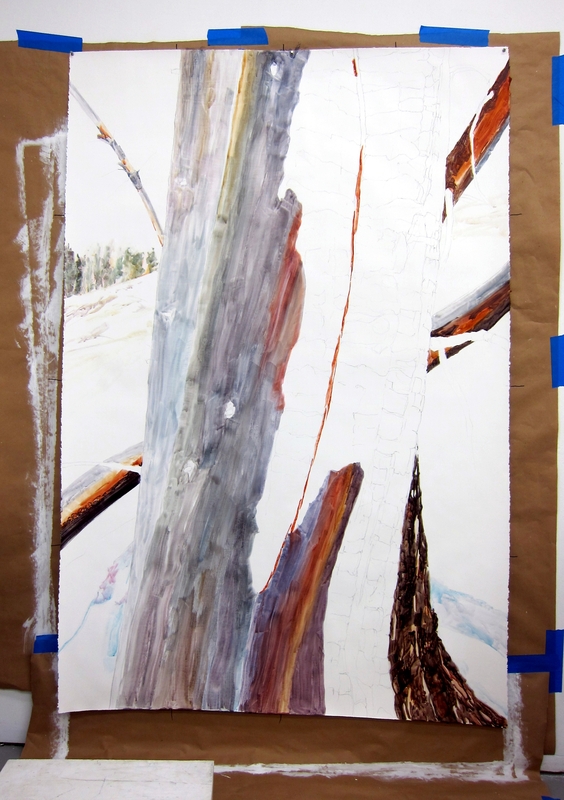 When I got back, I cut a 51 x 76 inch sheet and began gessoing it. If the painting works out, it will be my biggest single work to date. My goal is to combine the subject matter of the burn series with more philosophical and artistic contrasts. I bought a copper Christmas tree cookie cutter in the grocery store last night — and thanks to Karen Hackenberg — see that it makes a statement about our idealized perception of trees.